All spruced up and ready for your wedding! This evergreen wedding invitation features a rustic sketch of pine trees against kraft colored paper. Your names and monogram are printed in the font shown in your choice of color. 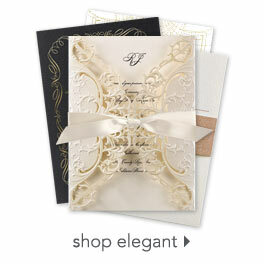 The two-sided invitation features a coordinating evergreen design on the back with your monogram. A perfect invitation to set the tone for your rustic wedding theme! These turned out really good! Simple, but gives enough info to our guests. Sturdy invites as well. Just what I expected, and it was very quick. The invitations arrived quickly. We thought they were very much like us, very unique. These were the only ones I could get him to agree to!Family feedback has been good as well. They all say that the invitations are beautiful and reflect upon us and the theme of the wedding very well.Thank you! I expected the paper on the response card to be the same color on both sides because you could see that it was on the invitation. It made it look cheap and homemade that the back was plain white card stock. I added instructions when I ordered my invitations to add my website to the back of the invitation under our initials. They arrived a week later without the website. I called and asked for assistance. I told her the website address and she assured me they would be mailed out 2 day mail corrected. A week later I received invitations and the website was incorrect. I complained and they said I could mail them back for a full refund. At that point my invitations were already late going out from their first mistake and I had no choice but to mail them out. I already thought they looked cheap and home made and then I had to hand write in corrections on the website. They completely ruined my invitations and I am extremely disappointed. I would not recommend this company to anyone. I would not have given them any "hearts" if that was an option. Wonderful! They look exactly like the pictures and are good quality. Arrived in plenty of time. Beautiful product. The paper was a nice heavy weight and the print job was very professional looking. I was a bit disappointed with the positioning of the top header as I had spent time adjusting the position to my liking, and they were printed differently than what I had saved. Other than that, I was very pleased. I really wish these had come with different colored envelopes which would have made them way nicer. I also wish we could have paid for upgrade printing options (Thermography). The bride and groom loved the design so we went with them, but I would have liked to upgrade printing and envelopes. Invitations by Dawn were fast, and easy to work with. They were able to make changes to the design for us without much hassle at all. I would definitely use Invitation by Dawn again if I were to need invitations. Great quality. Sturdy cardstock and the double envelopes are regular postage price which saved us money! Love the double sided printed cards! Card was affordable but seems so classy with the double sided card. These invitations are so unique; I love them. I'm not the kind of girl that wanted lace and tulle. These fit the bill perfectly. I'm using these for my wedding invitations. I liked the style and design, but some of my envelopes either did not have a seal or were dirty or upside down. For the price I paid, this was a little disappointing. But I still loved the invitations. Just a heads up for everyone, after I ordered from this website, they sold my email and home address to other companies. I was looking for an affordable quality invitation. This IS the site!!! I personalized and ordered the Spruced Up invitations, RSVP cards, and reception cards after ordering a sample and loving it. I personalized the invitations with different colors than what the sample came in and personalized the RSVP cards to match, and personalized the reception cards for both a set for reception information and a set for accommodations. I was a bit nervous when I ordered them but when I opened the box and saw them I was THRILLED!!!! They were PERFECT!!!!!!!! Absolutely beautiful, high quality, and affordable. I would recommend Invitations By Dawn to anyone who is looking for invitations! The delivery of the invitations was fast! I ordered them on a Monday evening and received them Thursday of the same week and they were perfect!